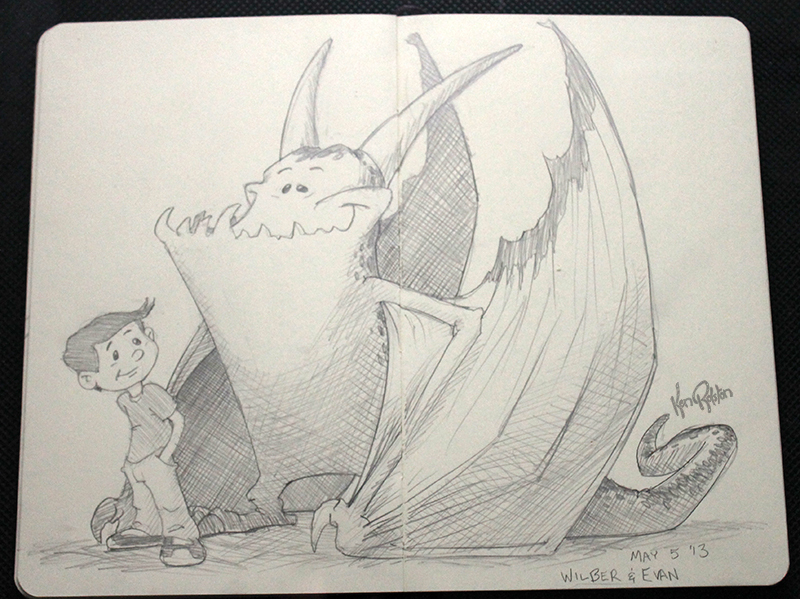 Dragon 526 – Nothing like hanging with you best pal on a lazy Sunday afternoon. I have to admit to being a little lazy of late with the write ups that go along with my daily drawings. Most of the time it’s a case of it being late in the evening as I write the posts for my blog, and I’m usually dead tired. Excuses aside, I felt it’s time to go back to the beginning and explain why the blog exists, and why dragons. Especially for my newest readers. Quite a few years ago now, I inherited a sketchbook from Aunt. The sketches in the book dated back to the 1940’s. It dawned on me that this might be a cool thing to do with my family, give a sketchbook as a gift that might be handed down to my nieces and nephews in the years to come. The thing is, I have 8 brothers and two sisters and with sketchbooks having 80-100 pages it doesn’t take a math genius to realize it would take years to complete these sketchbooks. So I went out and bought 10 moleskin sketchbooks and started sketching. Alternating sketchbooks everyday. The blog was a natural stage of progression. Posting daily drawings put a little pressure on me to actually draw everyday. My first goal was to draw one hundred drawings with the same eyes for each character. I went through a few other topics in smaller series, until I settled on the dragons. As a child I loved reading stories of King Arthur, knights, dragons, crusades, etc…it was only natural to go back to dragons for a series of drawings. Now as the birth of my son approaches, I’m fine tuning the series to be about the friendship between a boy and dragon. Hopefully a few of the sketches will be developed further, into digital paintings for my sons room.